I was catching up on laundry the other day, thinking and dreaming of what it would be like to have a room dedicated to cleaning our clothes. If you have/are living in an apartment, you’ll understand how hard it is to get laundry done when it’s in your kitchen, or in a hall closet, or even in your bathroom. Most older homes also are not set up with a nice place for laundry. Before our last move, we were actually turning some wasted space in our basement into a laundry room. We even had it piped for the washing machine before we had to leave. That was going to be an amazing space, let me tell you. There’s nothing I can do about that now, except wish, and work to make my current laundry room more user friendly. With a quick stroke of brilliance I reused an old Ikea shelf that was on it’s way to the trash and some twist ties to add an extra shelf above my dryer. Check it out! I’m still feeling pretty brilliant with that quick fix. Mark I do believe is laughing at my twist ties, but I made sure there were plenty on and spaced out enough to really hold and distribute the weight evenly. I wish I could tell you what shelf this is at Ikea, but I can’t seem to find it anywhere. Sorry. 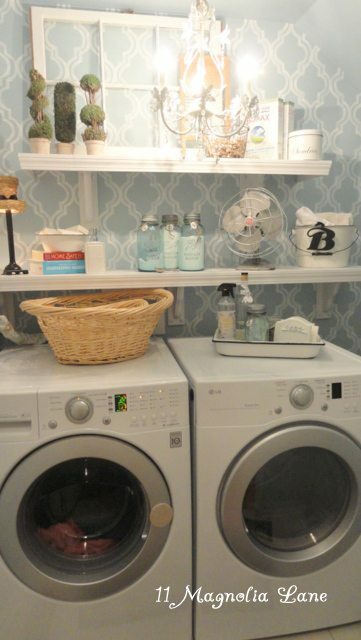 So then I got thinking, what would my perfect laundry room look like? How can I make my current hallway laundry room work more efficiently. I of course came up with this fun little board of things I want, and could use now, and in future rooms. A. Lime Laundry Drying Rack from One Kings Lane. I just wish it came in blue. Many clothing items you want to hang up, but have no good place to hang them, so you toss them in the dryer and cross your fingers…or maybe I’m the only one. Too many clothes have been ruined this way. B. Blomus Intro Pushboy Trash Can from Wayfair. Every laundry room needs a small trash can. I use it mostly for emptying the dryer lint. C. Lost and Found Sign from Zulily. This is the cutest sign! I don’t know anyone who doesn’t find random items while doing laundry. Having a place to quickly toss them lets you continue sorting, washing, drying and folding. D. 3 Sprouts Deer Laundry Hamper from Layla and Grace. Don’t like the deer, they have other cute animal print hampers as well. 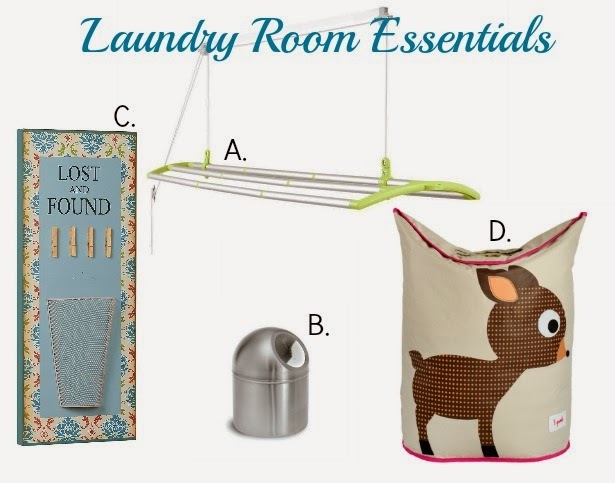 Or find something else to fit your tastes, but a hamper, even small is essential to any laundry room. I love pinterest for all things home design and tips. These are just a couple of pins from my laundry room board. My dream laundry room would have a sink like this to take care of any handwashing I need to do. This is just brilliant! 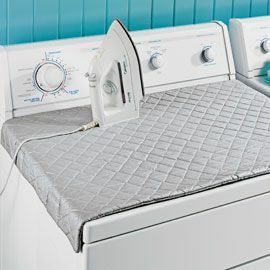 A quilted ironing mat for your dryer. Definitely friendly for small spaces. I want one. This laundry room from 11 Magnolia Lane is so chic. The chandelier would make me feel I was relaxing instead of doing a chore. Don’t you think? 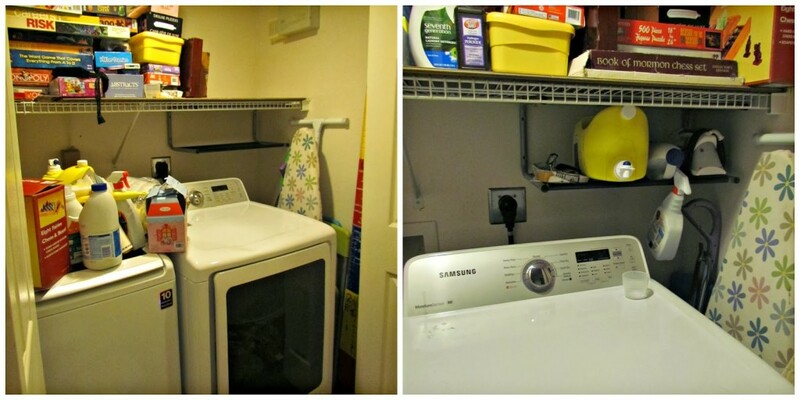 Just from browsing pinterest, I’ve decided to make a laundry room feel less like a chore, it needs some bright colors. Too bad I can’t paint here. One day. One day. Maybe I’ll see if I can make over my mom’s laundry room. So frustrating not to have work space… I think you used the space you have very well.